(CHRIS) It was well after midnight when I heard stirrings outside. It was a half moon and so I unzipped the window to have a peak. There were 2 sets of eyes glowing near our neighbors’ food table 40 feet away. I used my flashlight to discover a little fox or jackal scavenging. The other eyes were higher up, so I thought his pal had climbed on the vehicle or furniture. But as he came out of the shadows, I saw that he was no fox. He was a giant moose-like hoofed creature with two 3-foot horns. We found out later that he was a gemsbok. He walked by our tent within 3 feet. Cool! I fell back asleep after watching him for a few minutes. (SAM) We awoke to the smell of coffee, eggs, bacon – Oh, wait, I was still sleeping. We awoke to the smell of gemsbok dung. The gate opened and we drove to dune 53. 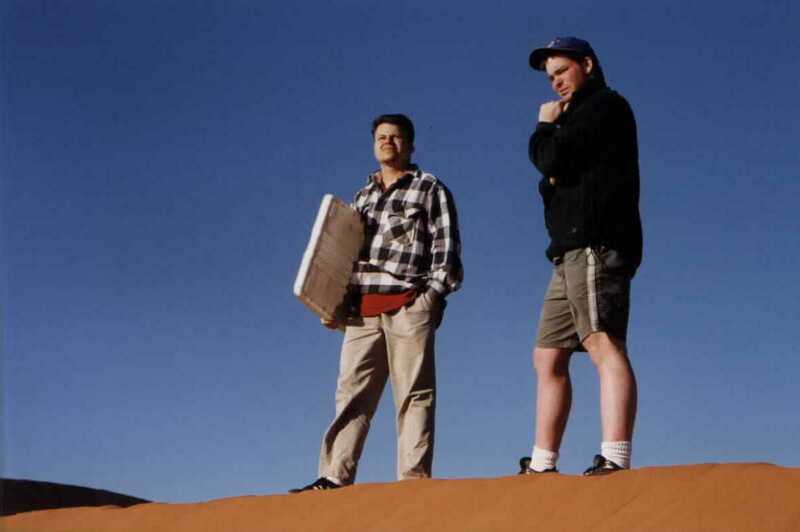 It is rumored that the Namibian FBI has a secret UFO buried under the dune. The dunes were cool, I must admit. At any time, I expected C3P-0 and R2-D2. 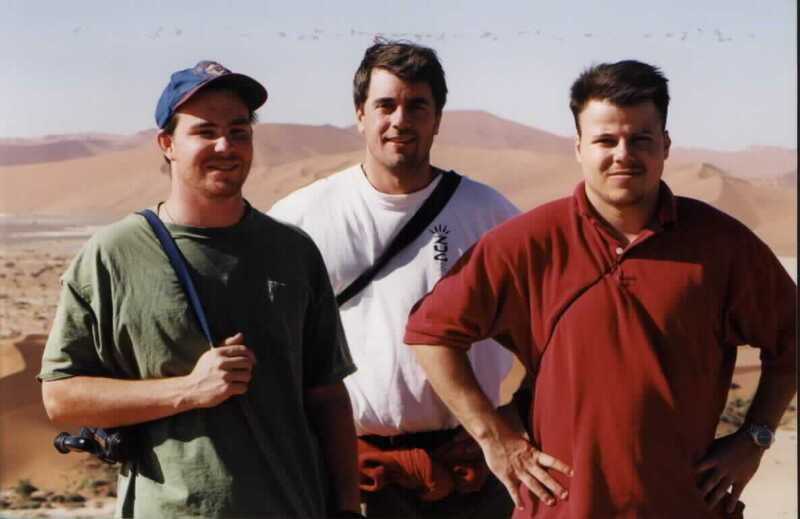 To my disbelief, Paul and Chris started to ascend the huge dune. Neisha had told us about sand-surfing, so I brought the top of one of our plastic roof top containers. At the top of the dune of doom, we tried to surf, but the plastic top was not designed for maximum surfage. In short, the whole expedition failed miserably. Some of the other people who showed thought we were cool anyway. Not to disappoint the crowd, we ran down the sunny side of the dune. Even though the dune was very steep, I could not pick up much speed because my foot would sink down into the sand. All three of us made it down the dune to the cheers of amazed tourists, with almost no casualties. (CHRIS) Altho the area is not known for animals, we saw some springbok on the way to the farthest, biggest dunes. These are like deer with racing stripes and springs on their feet. The last 5 km’s were for 4WD only and the Rocsta held up pretty well on the sand. 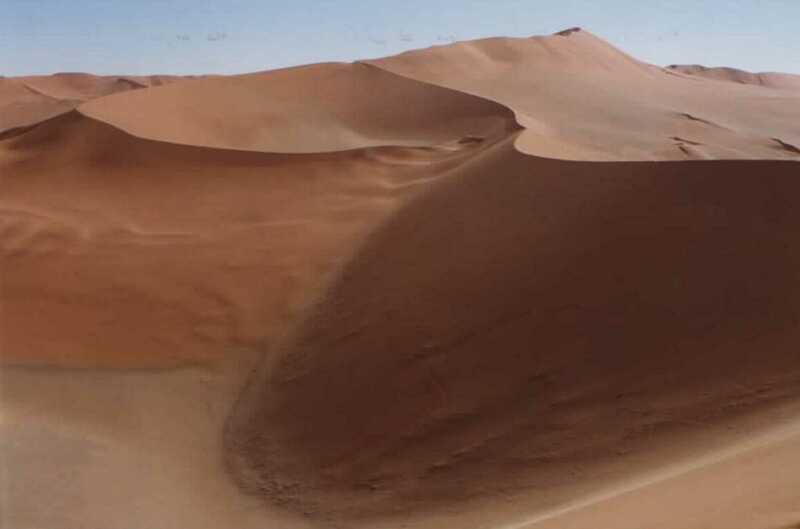 The dunes became increasingly magnificent as the trees became scrubbier and the ground more cracked and dry. We had some food to strengthen us and then we ascended the coolest, biggest dune, Sousselvei. We saw Banthas, but no sign of the sand peop… Ahhugh! Ung Ung Ung Ung! But, we really did see a cool sand bug decorated blue and white. The view at the top of the dune was fantastic. We became better at sandwalking as we became more experienced. Walk mostly with the toes and use someone else’s footprints. Sam and I ran down one side. It was steeper than Dune 45, so it was more fun. It was a long, dusty 63 km’s back the way we came, but the beautiful red dunes made it bearable. We jaunted over to Seserim Canyon and found it abandoned of tourists. Paul was so happy about this that he wandered into the canyon, leaving the jeep unlocked and the door hanging open! The canyon had lots of side nooks inhabited by poopy pigeons. There were also some cool beatles and killer bees. The canyon was narrow and steep – about 20 or 30 feet deep in most places. It was about 15-20 degrees cooler in a side canyon that had a poopy watering hole. I walked up a different way than I came in because, as a T’weed, I hate back-tracking. I found myself on the wrong side of the canyon, looking over at the exposed jeep. Jawas were breaking it down for scrap metal and I could do nothing. Just then Jedi Knights Qui-Sam and Obi-Wan Clemens emerged and rescued the Rocsta. They told me to use the force to cross the canyon. With Leia clinging to me, I found a spot and jumped across. We got on the road north and cut thru a segment of Namib-Nakluft Park. We saw a bunch more springbok and ostrich. We also got a great look at some of the huge gemsbok in full daylight. We got some gas at Solitaire, a little rest area that had lost power some weeks ago. They had to hand-crank the gas pump. Paul debated the clerk inside on whether speghetti in a can really existed. He made sure Paul understood that tonight’s destination was Walvis BAY, not merely Walvis. We bought “a crisp lemonade-beer drink” called Frostie for the night’s dinner. After our snack, we drove on. The Frostie began to talk to us from inside the shopping bag, “Drink me! Drink me now before I grow warm! Warm beer is evil!” With the sun beating down, we caved in to the evil temptation – we drank and drove! The first sip was Okay and we made the best of it, “Not bad.” Soon as the word escaped our mouth, the aftertaste set in. It was so horrible that we thought we must already be drunk and having a nightmare. The can said, “0.5% alcohol” so either the dream was tricking us (most S.A. beer is 5% alch) or it really was horrible. So we gulped it down fast to make it go away. We re-entered the park thru some small mountains. We thought we might camp in the park, but it was so desolate, it scared us straight thru to Walvis at sunset. On the way, we saw a land we shall never forget. It was like a mammoth gravel parking lot. For miles and miles in every direction, pure rock and gravel. Amazing. We crossed 2 “rivers”, both of which were completely dry. We saw an 8 person tour van flipped over on its roof. The people were standing by in good shape with only minor injuries. They assured us that help was already on the way. They had blown (ie – exploded) a tire and lost control. The ambulances began arriving minutes later, but we were already on our way. Walvis was a blah town. We saw lots of birds in the lagoons, but elsewise it was a bust. Even the campground had recently closed. So we went 15 km’s north and camped at a site there. Of course, it was sand again and cool Atlantic temps. We cooked up some speghetti, keeping an eye on the suspicious “guards.” We went to sleep as the life-giving nightly fog rolled in.